The Macau Tourism and Cultural Activities Center (CATC) opened its doors at the end of last month, and will provide a variety of cultural and destination information services to visitors. Situated near the Ruins of St Paul's, CATC has five floors. 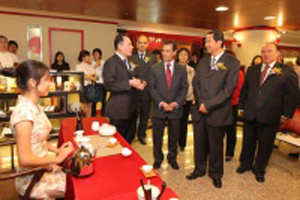 The ground floor provides information on tourism, hotels, restaurants and transport for visitors, while the second floor has the Macau Tea Story, which showcases the art of tea through tea tastings and tea products. The basement has a multi-function hall with an exhibition on Macau’s world heritage and the latest hotel developments.